No added sugars or anything and deliciously refreshing. 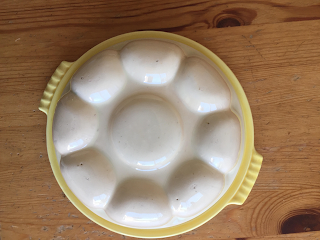 We also went to a charity shop & amongst the many items I found a yellow dish. A vintage pudding plate, I have a tiny collection of pudding moulds. But the dishes on which they sit are missing. I hoped that one of them would fit the yellow plate and it was so, what luck :) How perfectly wonderful to have one that is all together again. How have you been? 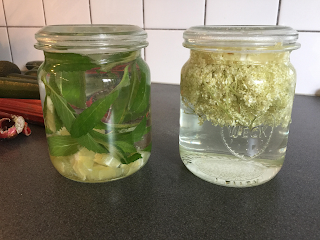 Made Elderflower water? Been to a charity shop & found a "new" treasure? Do tell, we'd love to hear from you!